Why is Steampunk so much fun? Well, friends, it's all about invention and imagination. Sure, you've got to stick to certain elements. You've got to have mysterious pouches and pockets to keep your mysterious devices in. There's a hip pouch for gunpowder and extra springs for your steam-powered smartphone. Then there are the pockets for all your magnifying glasses and all the keys to wind up your robots, clocks, and maybe even a time machine or two. Okay, let's move on from those mysterious pockets of your Steampunk ensemble, it's taking some self-control. Believe us. A good Steampunk ensemble also requires gear oriented jewelry, a jaunty hat, and most of all... some sweet goggles to make riding your steam-powered snail easier than ever! When you're putting together that perfect Steampunk ensemble, it's all about the accessories. Stand out in any crowd with these brassy goggles. This headpiece is intricate with molded coils, chains, and cogs so you can be sure the details won't shake loose through your adventures. The chains dangle from the mask, giving your whole face an air of mystery. Are you ready to shake things up with a head-turning ensemble? 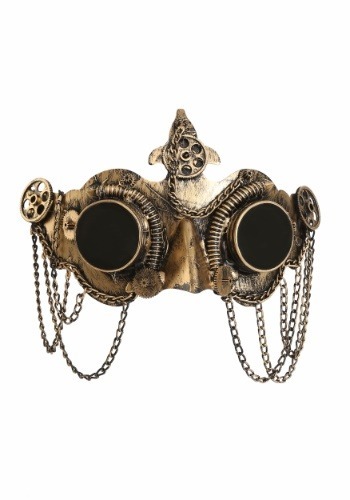 Top off any steampunk look with this brassy mask. Want to add more details to your ensemble? From canes to jewelry to lovely corsets, you'll have a great time scrolling through our Steampunk products.